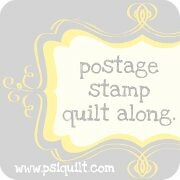 Canoe Ridge Creations: postage stamp quilt along. After seeing Cherie's progress on her postage stamp quilt along, I have decided to join in. I am very excited since this is my second quilt along (the first being the Sliced Coins Quilt Along). So, what jelly roll have I chosen you might ask? Bliss. Yummy. Here's where I need a little help. I am trying to decided between using Kona medium-gray or Kona white opposite the Bliss. I like the white, but is it playing it too "safe"? The gray is nice, but does it mute out the Bliss? What do you think? If you interested in joining in, here are the details. Awww, thanks! 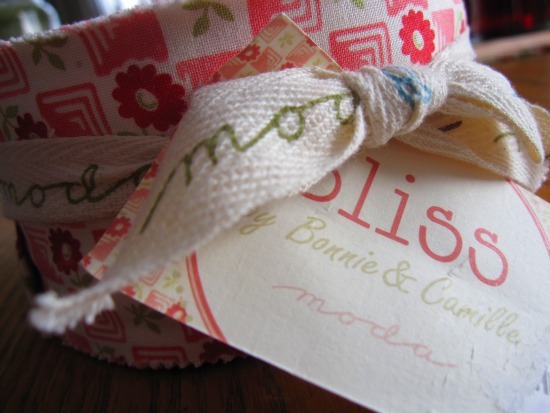 I will have to take a look at the Kona card tonight to see what looks good with Bliss. I would have to vote for white. Just think the gray is too dark and will take away from the freshness of Bliss! It will be beautiful no matter what. I think white too. I was thinking grey with mine also (even though I'm using a different line), but the white really makes the colors pop! I think I'd go with white too. I wasn't going to join this quilt-along, but I got sucked in! I'm using Hello Betty Retro. I think that gray is too dark, the bliss has a bright springy feel to it, that dark gray is more wintery feeling. At first I thought the gray would make the colours in Bliss pop, but I think all it will do it drown out the colours and drag it down. Now seeing that you gave in, makes me want to give in and join. I really shouldn't! I have too much going on. I'm doing this quilt along too, and it's really exciting! I think white! 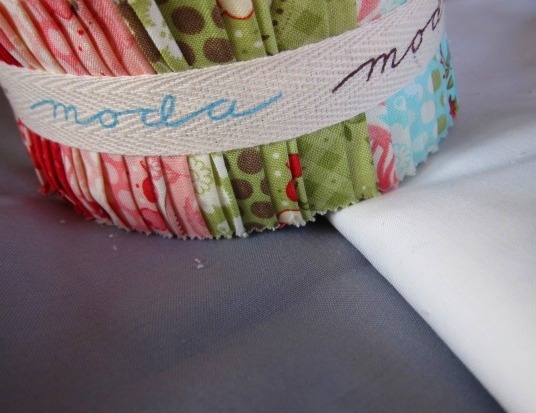 I am doing this quilt along with Bliss, too! I am just cutting up some yardage I ordered. I think these prints will look awesome in postage size :-) I ordered some linen to go with mine....haven't got it yet, so haven't had a chance to get started, but my "backup plan" is white...though I saw a gorgeous pinwheel Bliss quilt with grey...tough choice!